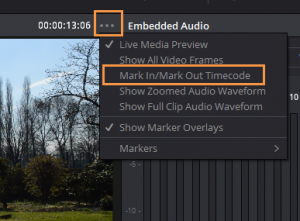 The idea behind making selection in clips is simply that when you come to edit your clips together into a sequence of clips (called a timeline) you don’t want to have the portions of those clips that aren’t needed included in the timeline. So, say the camera is rolling and then the action begins … and finishes … and then the camera stops. Well, by making selections within clips you can tell Resolve that you don’t want to use the bit of the clip from when the camera started rolling up to the point where the action begins – which is called an ‘In Point’ – the point at which usable footage starts. 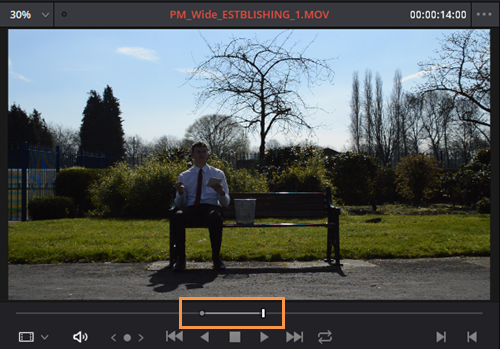 Then, you play or scrub through the clip until the usable footage ends and you create an ‘Out Point’ – which simply tells Resolve that you don’t want to use any of the footage following that point. The clip may have been 15 seconds long initially, but when you use an In and an Out point the end result is that the clip is only say 7 seconds long – but all the unwanted parts are excluded so that you only have usable footage. The other (quicker and simpler) way to do this is to use the keyboard shortcuts ‘I’ and ‘O’ (which you may note are directly above J, K & L). ‘I’ creates an In point wherever your playhead is and then play on a little and hit ‘O’ to create the Out point. And, if you mess them up, as long as you haven’t included that selection in a timeline yet, you can redo In and Out points as much as you like. However, as you can see from the images above, even though I have created an In and Out point for this clip, there isn’t any way to see this at present. 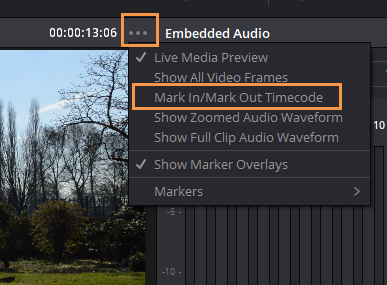 So, to be able to show this, clip the little options menu to the top right of the viewer (the three little dots) and select ‘Mark In/Mark Out Timecode’. Now you can work through all your clips to only use the footage you want. 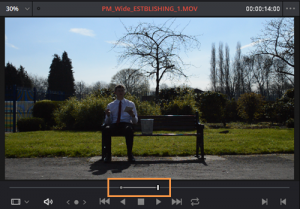 Whilst this is great if you only want to use one part of each of the clip you have, there are often times when you want to use multiple parts of a piece of footage for various reasons and we’ll have a look at how to deal with that in the next blog.